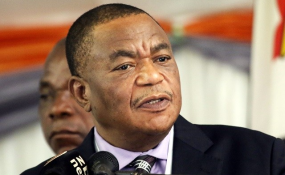 VP Constantino Chiwenga (file photo). A 30-year-old commuter omnibus driver whose vehicle collided with Vice President Constantino Chiwenga's motorcade was yesterday sentenced to an effective two-and-a-half years in prison. Silent Hungwe was found guilty by Harare magistrate Ms Barbra Mateku. Ms Mateku ruled that the defence, which was provided by Hungwe in court did not suffice. She said the brake failure, which Hungwe claimed had happened suddenly leading to the crash, had been proven by State witnesses to have been an ongoing problem. "The accused (Hungwe) has been found guilty of the crime as he failed to perform the required pre-vehicle checks before he drove his vehicle. This is something he would have known had he been taught during the driver's licence lessons as required before one drives. "Therefore he has been found guilty and I sentence him to an effective 12 months in prison for driving without a licence and he is also not allowed to drive any car in the same class with commuter omnibuses for the rest of his life. "For the accident, I sentence him to 18 months in prison and these sentences are to be served consecutively," she said. Prosecuting Mr Isheanesu Mhiti had told the court that on August 24, Hungwe failed to control his vehicle along Borrowdale Road and hit Vice President Chiwenga's vehicle on the side. No one was injured, but the vehicles were damaged.